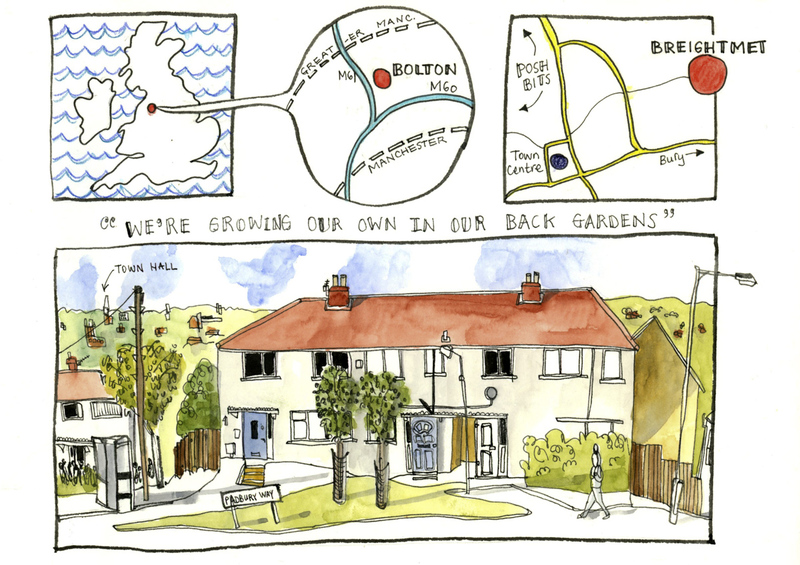 I was delighted to be working with Bolton at Home again after the success of As Rare as Rubies. 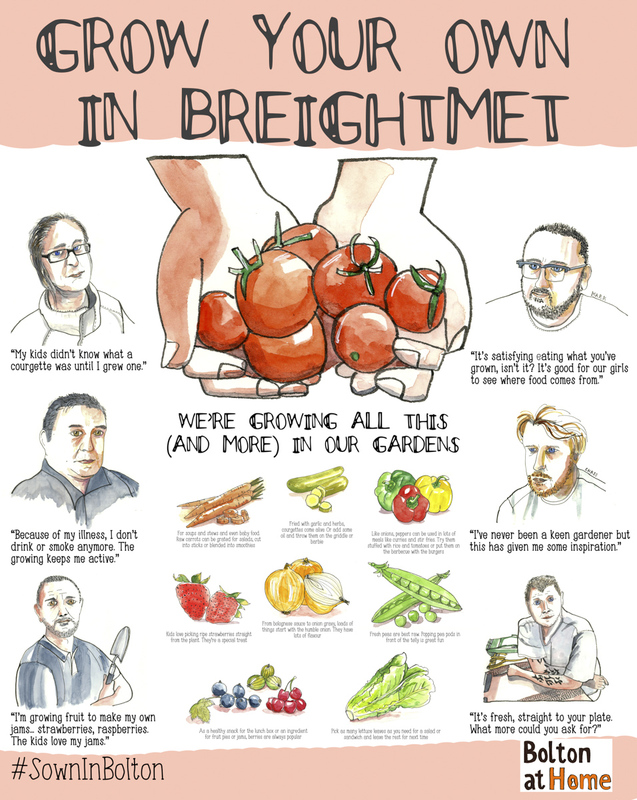 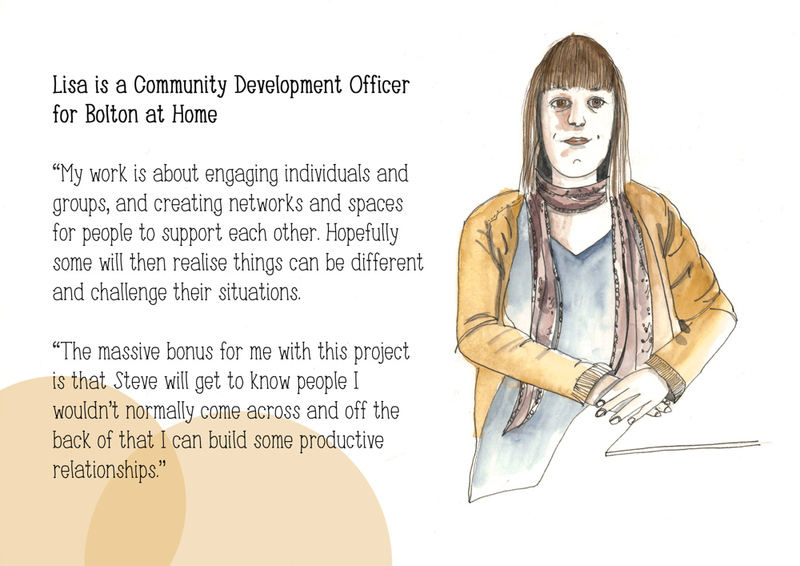 This time the nice people at Breightmet UCAN centre asked me to tell the story of their growing project in sketches. 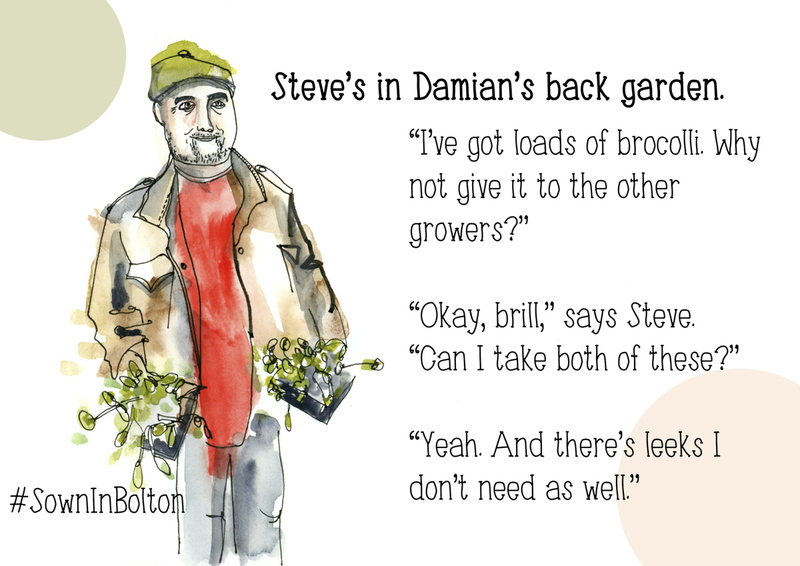 From March until September I followed Steve from Bolton Urban Growers – he’s the one with the green beret – as he supported residents to tend their potatoes and strawberries. 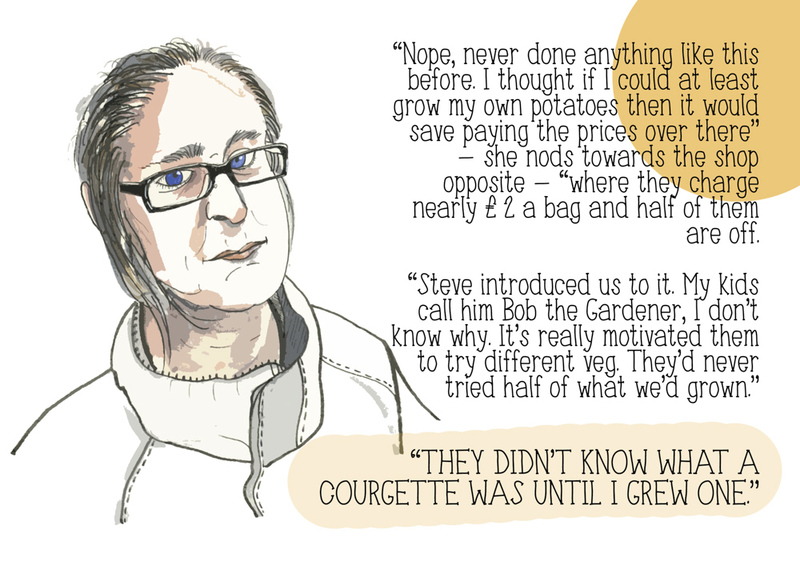 On a housing estate where many struggle on welfare benefits, growing you own food might seem obvious. 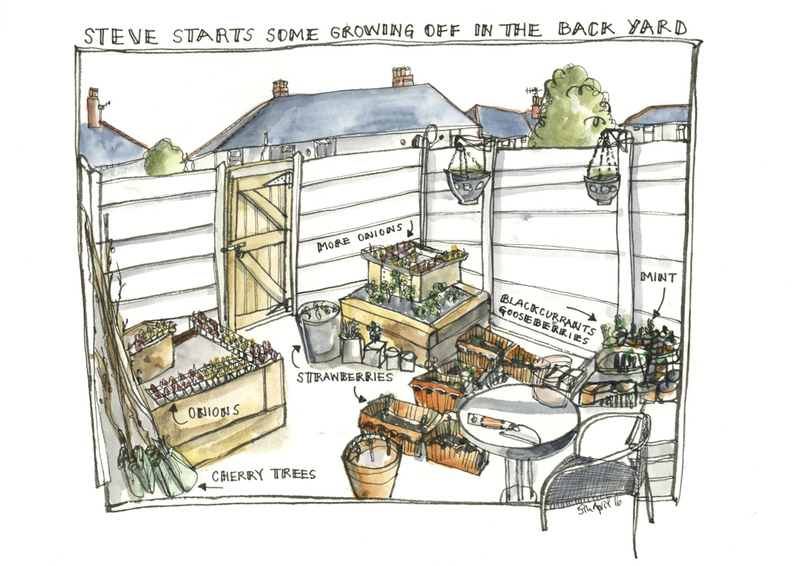 But, as I found out, there are plenty of barriers to turning the garden into a mini-allotment. 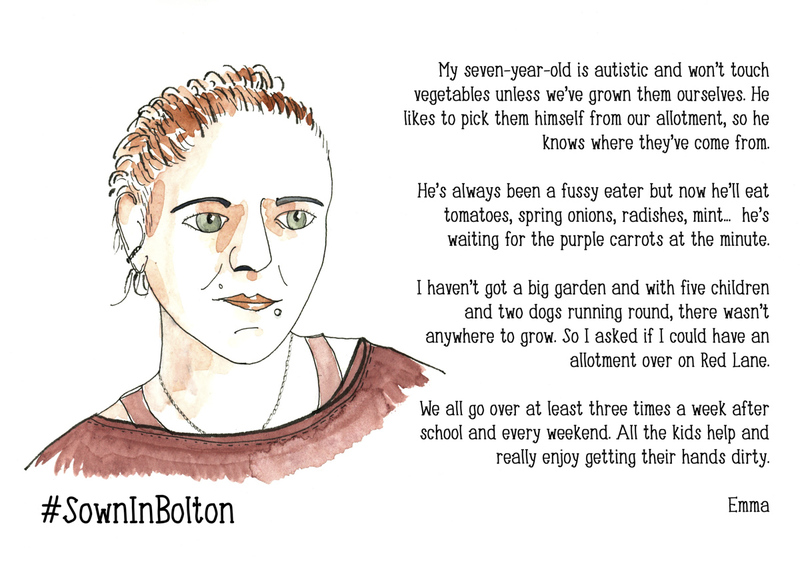 But dozens of families did get involved this year – my drawings encouraged quite a few – and I discovered this modest project was about more than putting fresh food on the table. 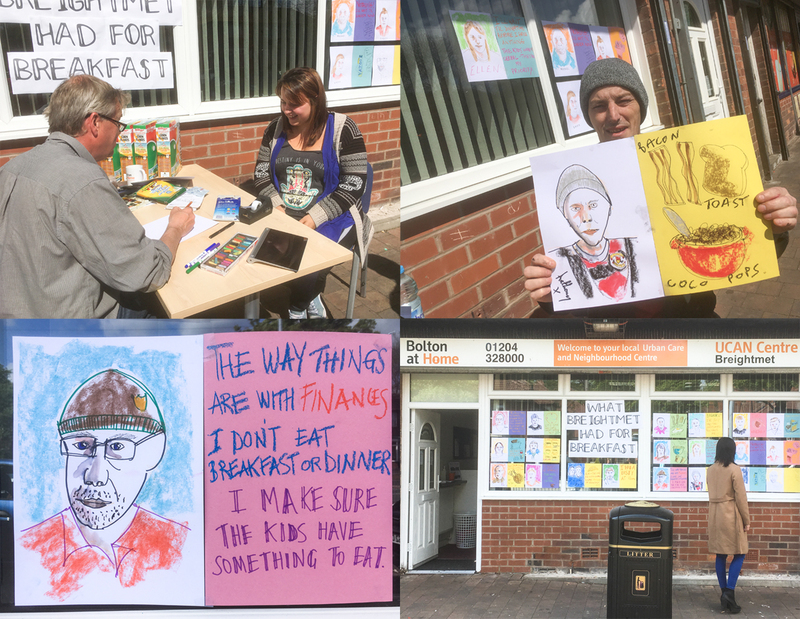 My sketches were displayed in the UCAN advice centre; widely shared on social media (#SownInBolton) and have been printed in a 24-page ‘best practice’ booklet to evaluate the project. 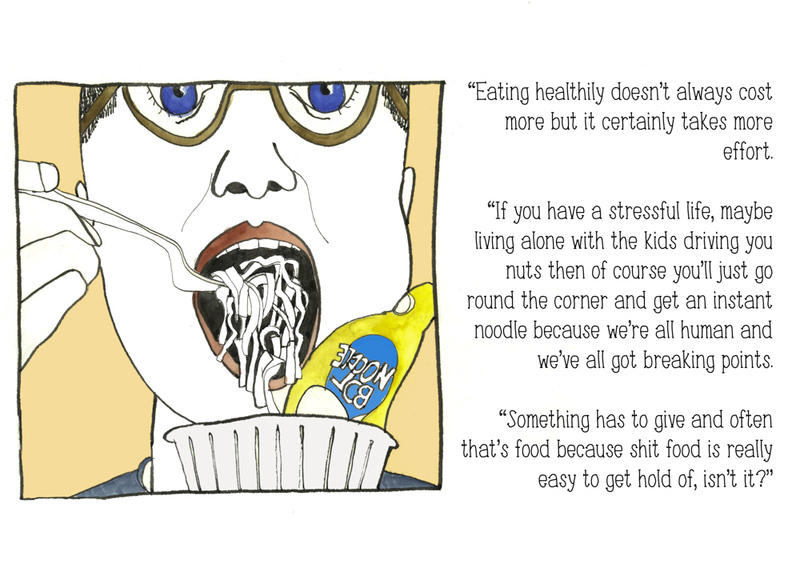 See the publication here. 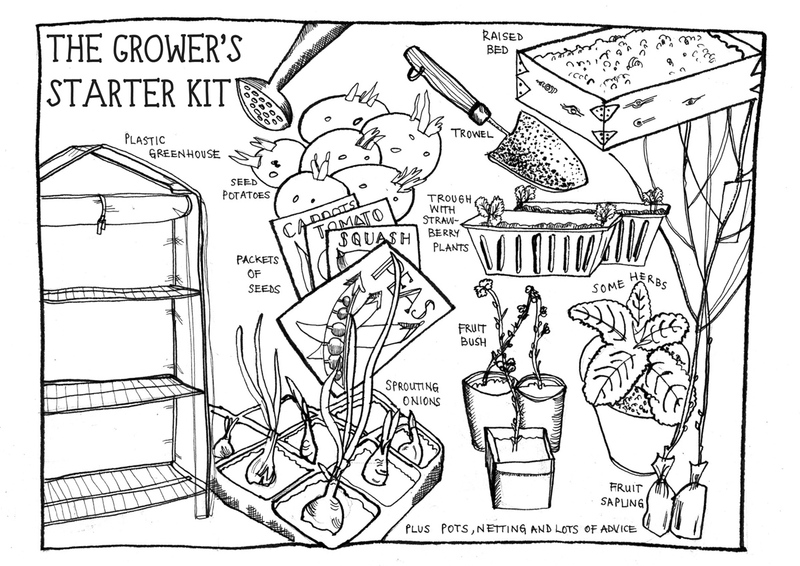 The growing project kicks off with a recruitment drive for new growers. 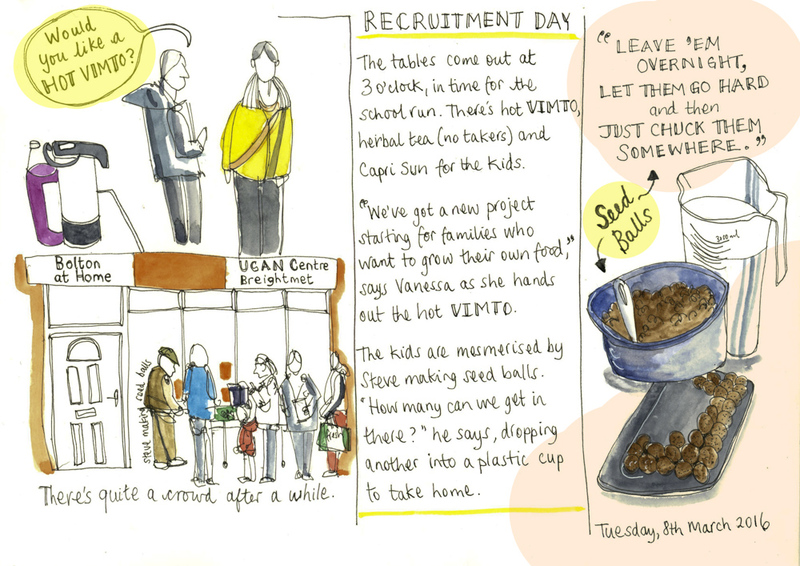 Within a couple of hours the hot Vimto is gone and the clipboard is full of names of eager growers. 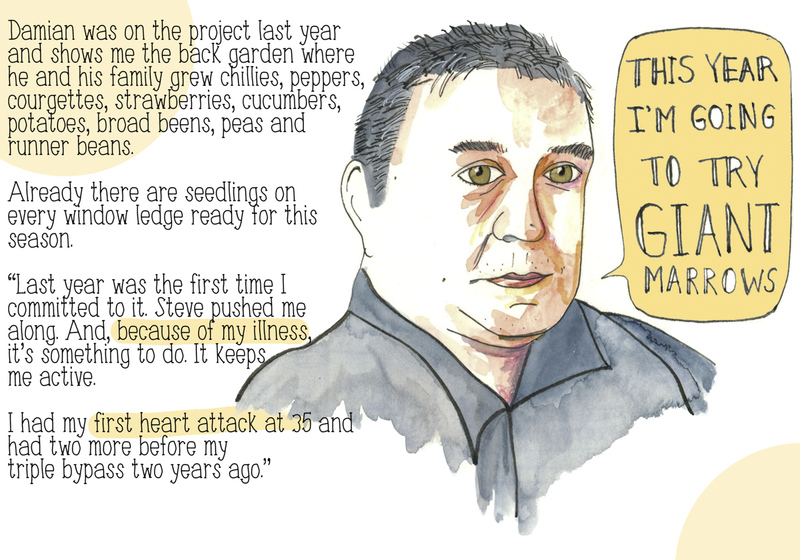 In the following weeks Steve introduces me to some of last year’s gardeners and I get a feel for what impact a couple of bags of compost and a few seed potatoes can have. 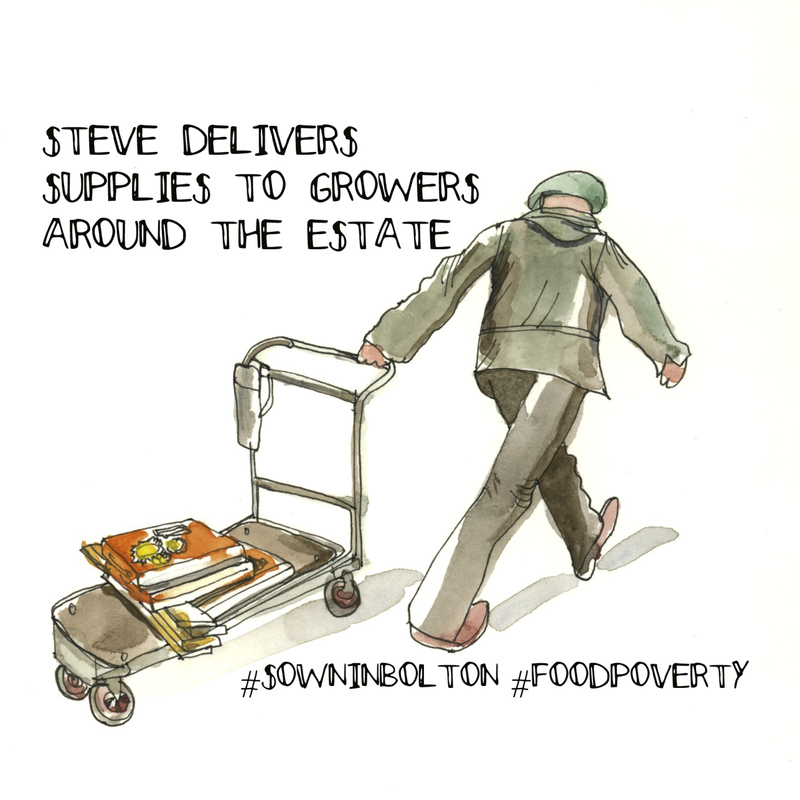 There’s lots to organise and Steve spends Tuesdays distributing supplies to this season’s growers. 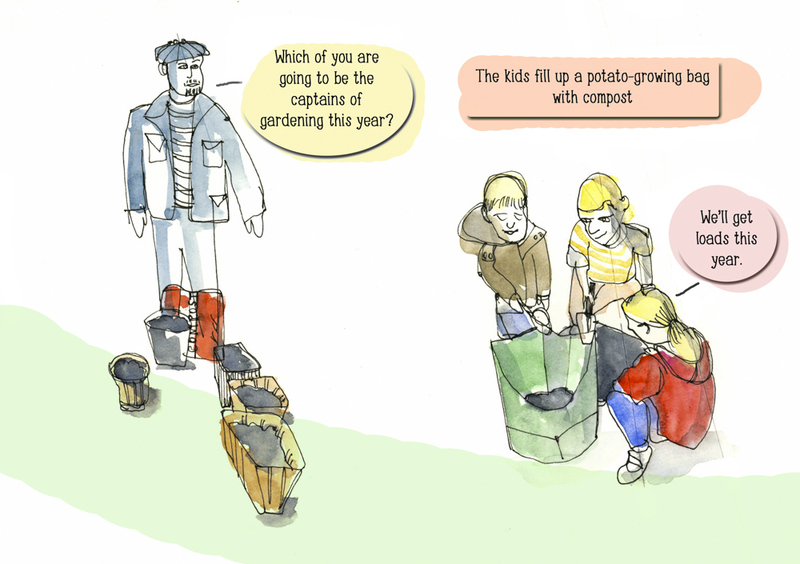 There’s compost, raised beds, pots, seedlings, fruit saplings and much more. 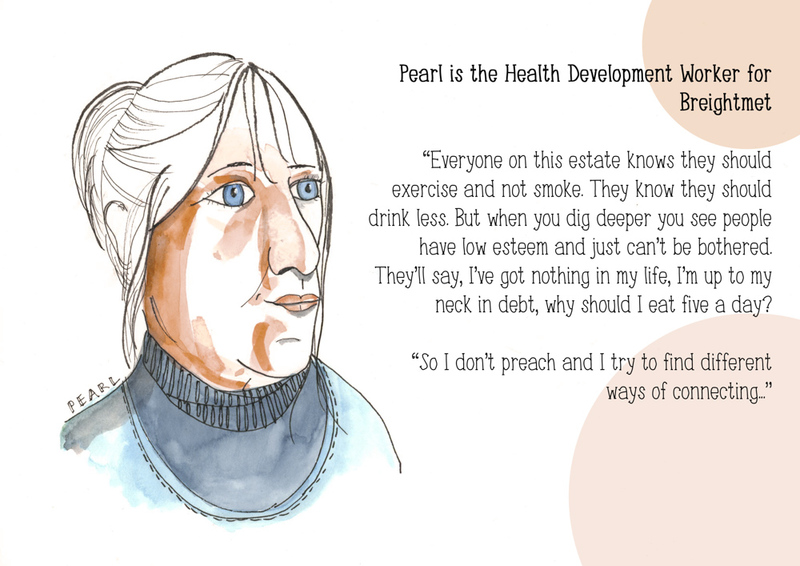 Steve will work with Bolton at Home’s Lisa and health advisor Pearl, who both have strong views about food poverty and how it affects residents on low incomes. 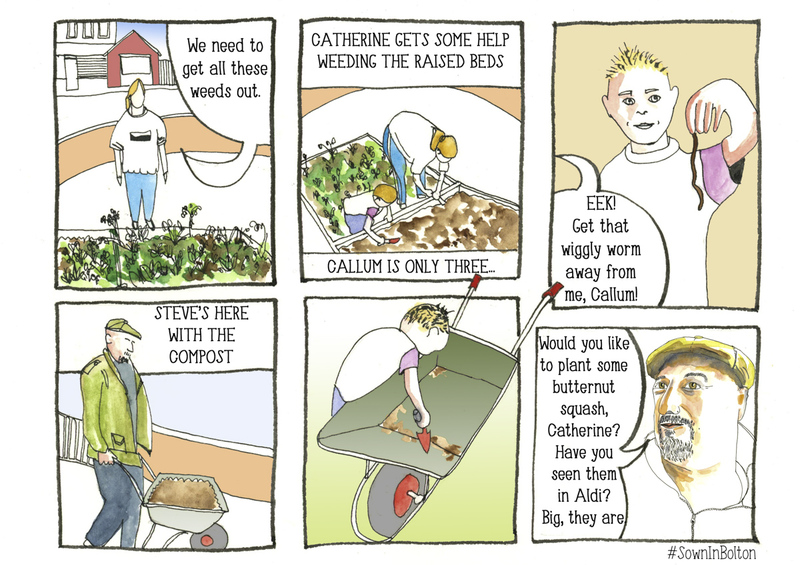 I get introduced to Mark and Suzanne who had grown a little last year but were going for it this time round. 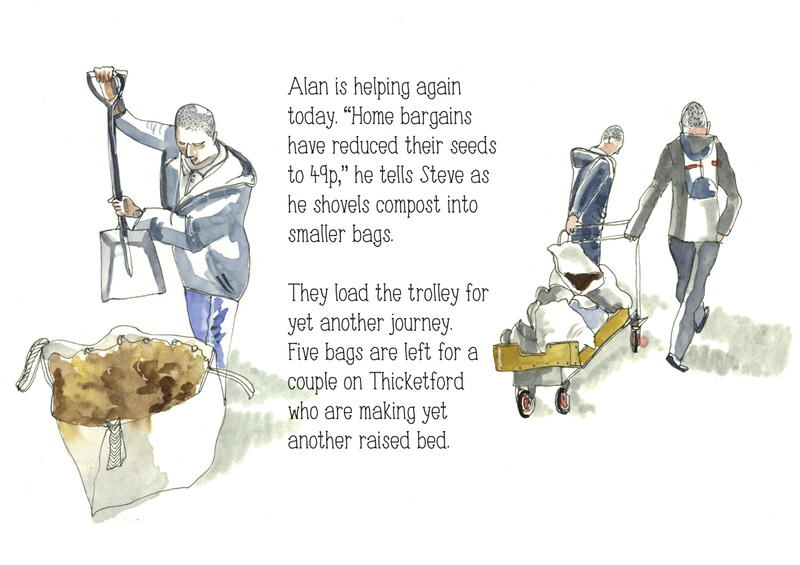 Steve helps with materials, seedlings and lots of advice. 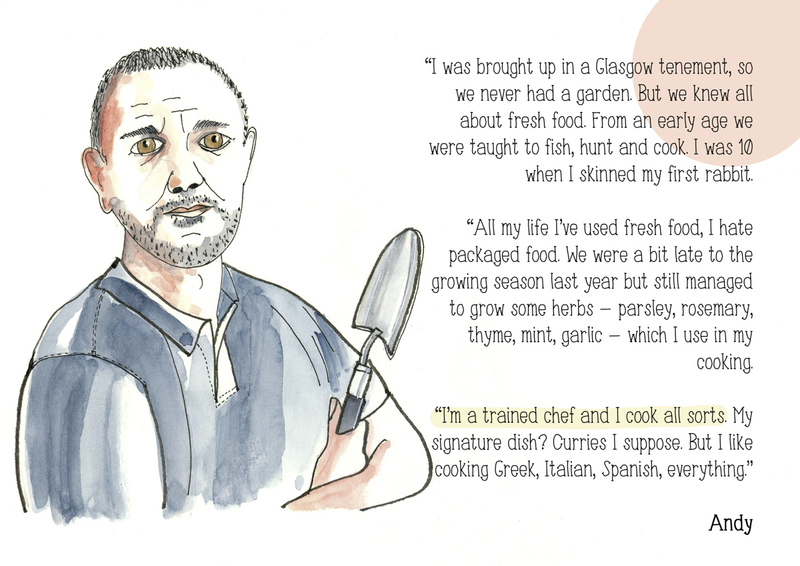 And then there’s Andy who loves making jams from home grown fruit and is quite happy to go hunting for his own food. 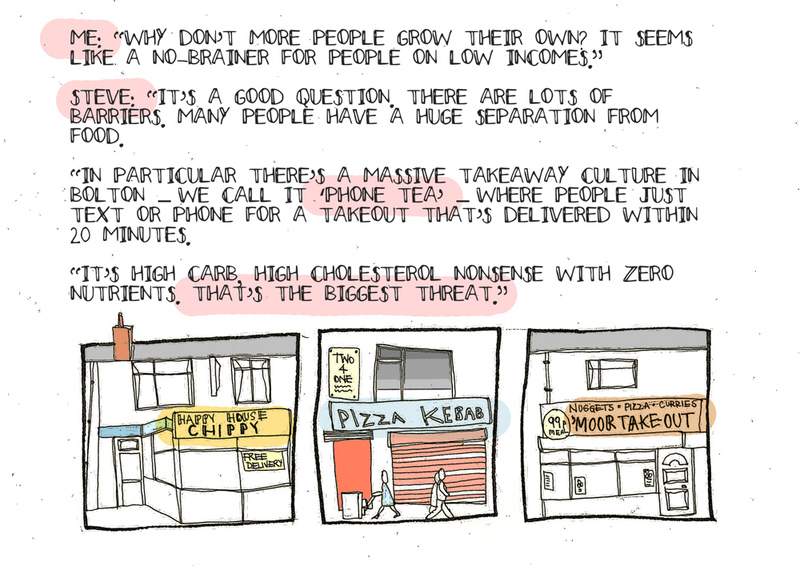 Thing are hotting up in Breightmet. 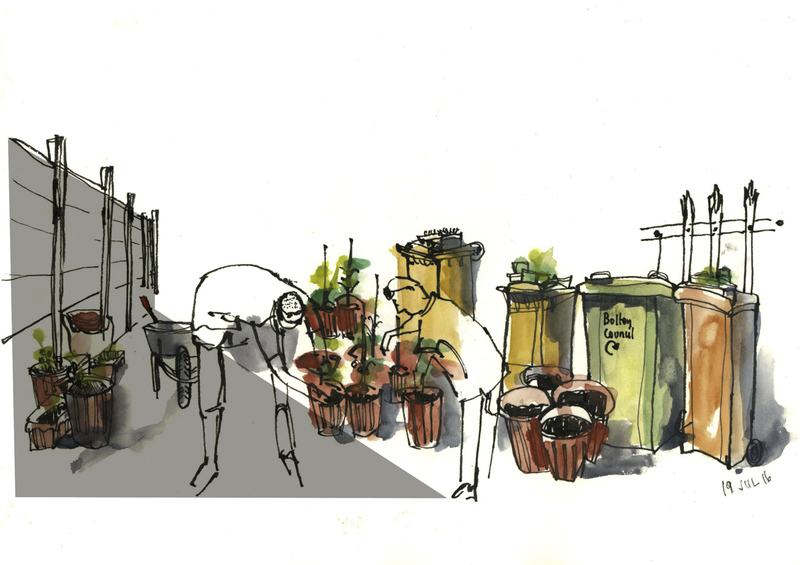 Some vegetables are already being harvested and others are just going in the ground. 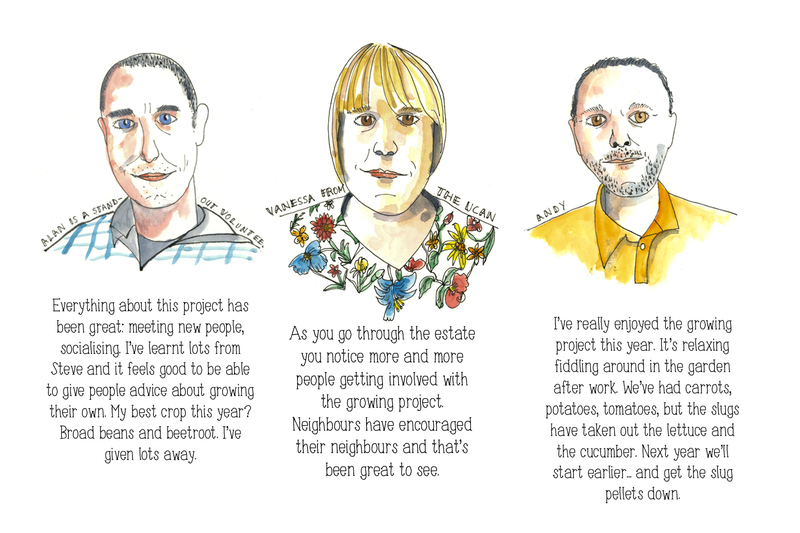 I love how this project gets neighbours talking to neighbours and, with a little help, people start doing things for themselves. 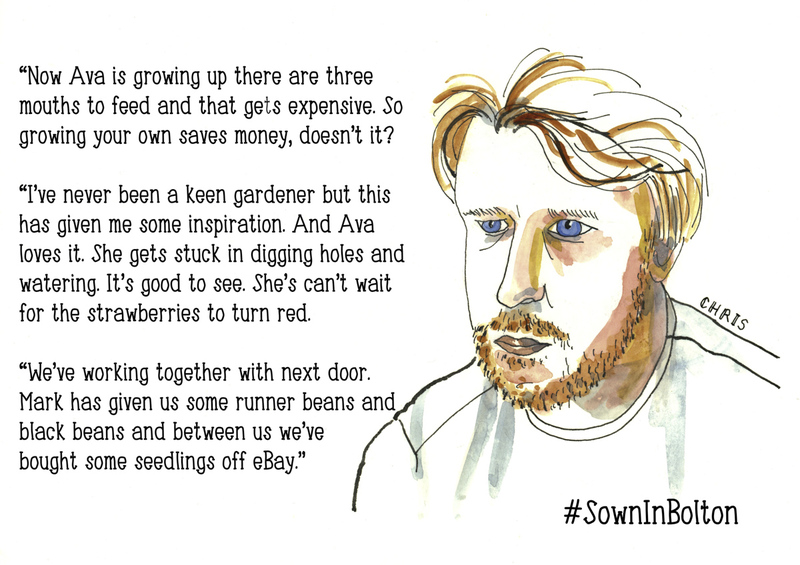 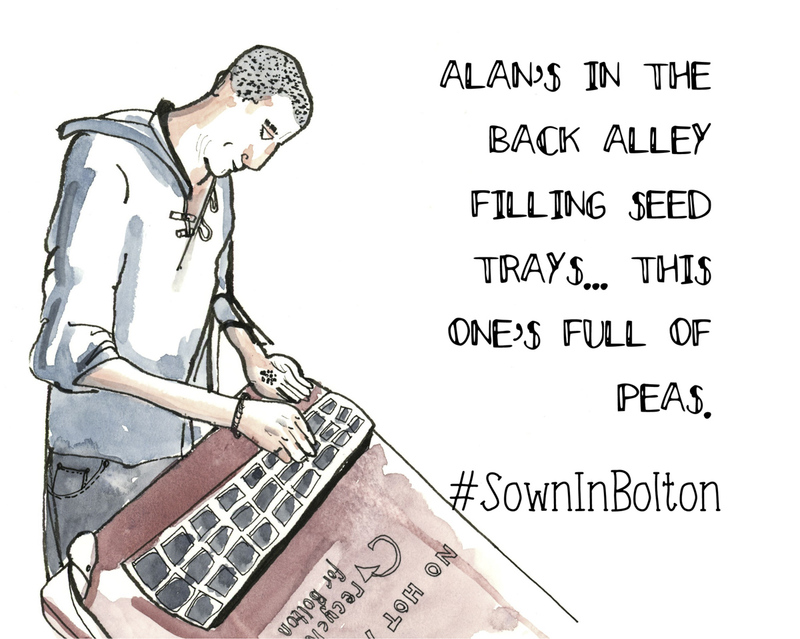 Sown in Bolton is about growing your own but in the wider context of food poverty. 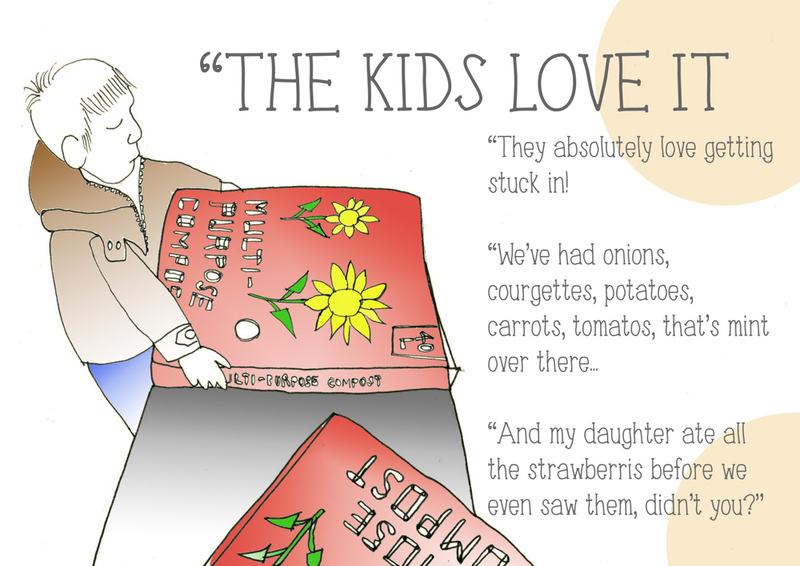 I’m interested in the challenges people on low incomes face when feeding their families. 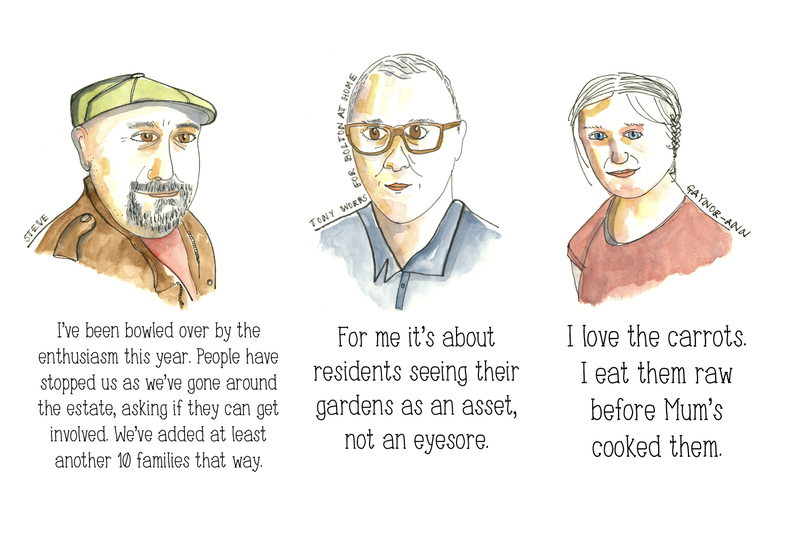 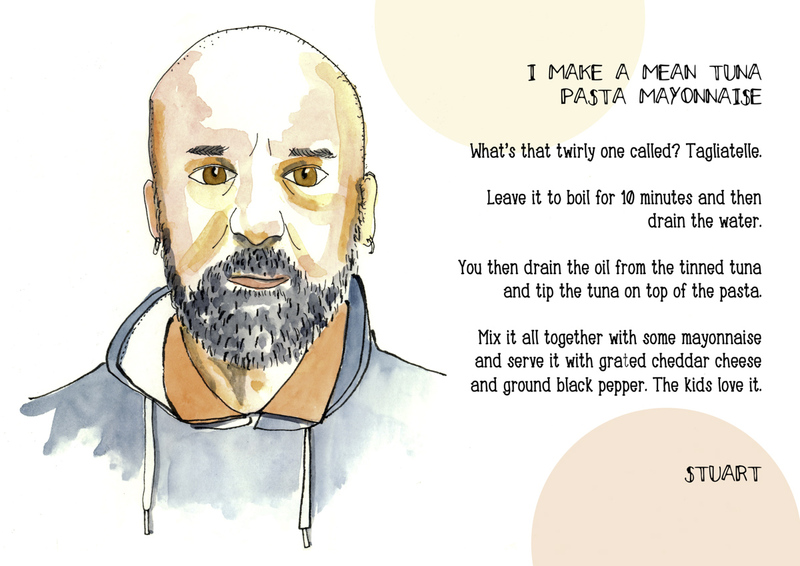 On one sunny morning in July I decided to take my sketching project out onto the street and ask people what they’d eaten that morning. 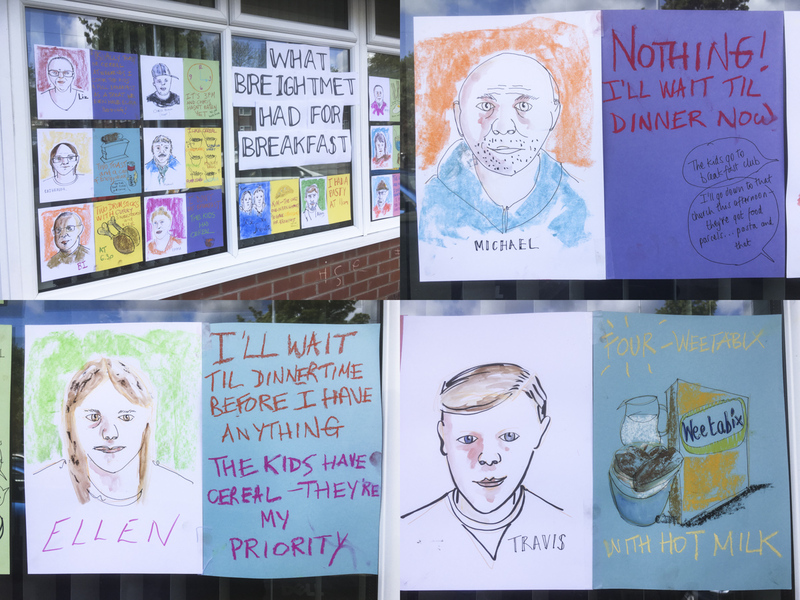 What Breightmet Had for Breakfast was a fun and popular on-the-spot exhibition with a serious message. 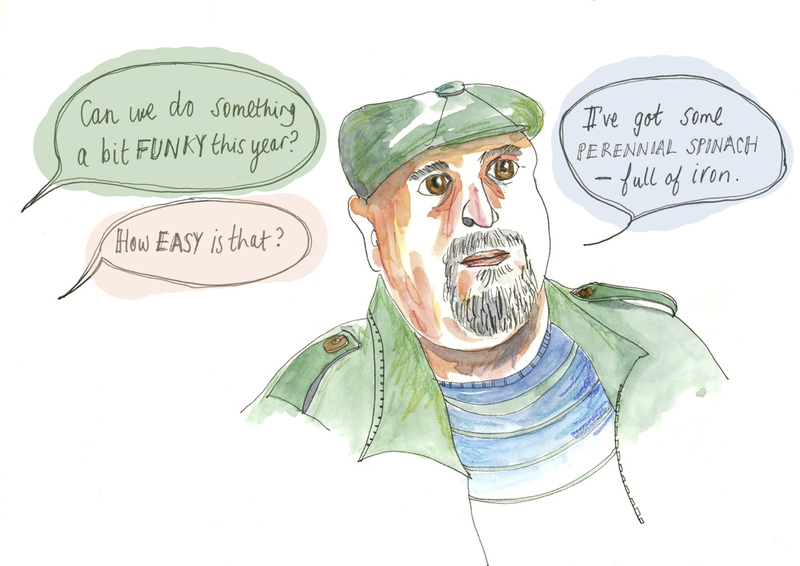 My six months is almost up. 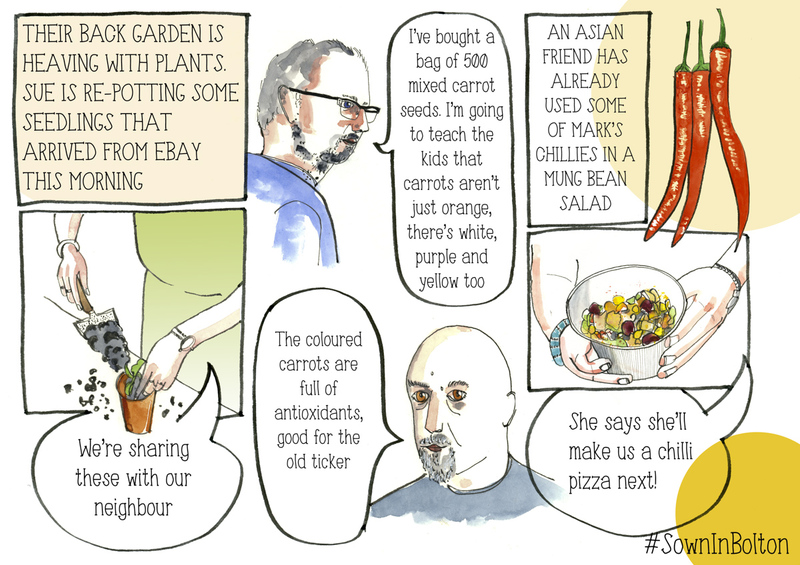 Many gardens on the estate are bursting with vegetables and people are exchanging crops with one other. 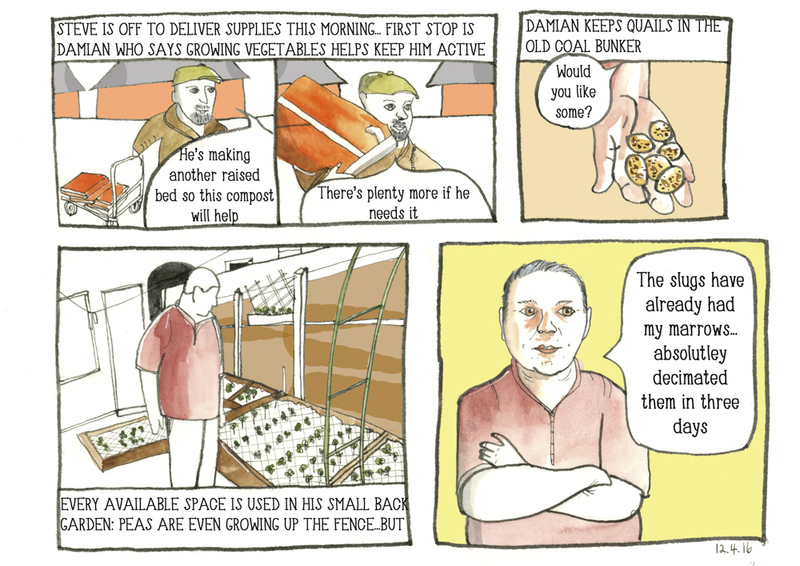 There’s often excess fresh food at the UCAN for customers to take away. 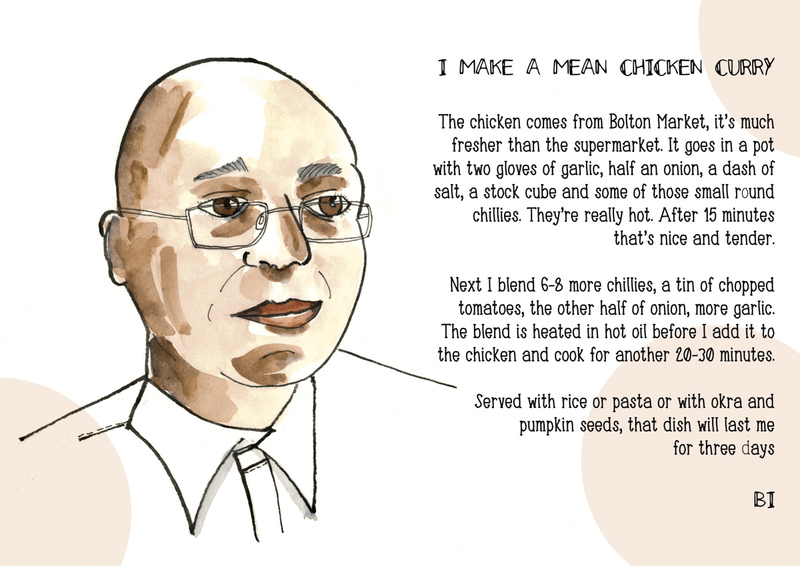 I go off on another tangent, asking UCAN customers what they can cook – with some surprising results. 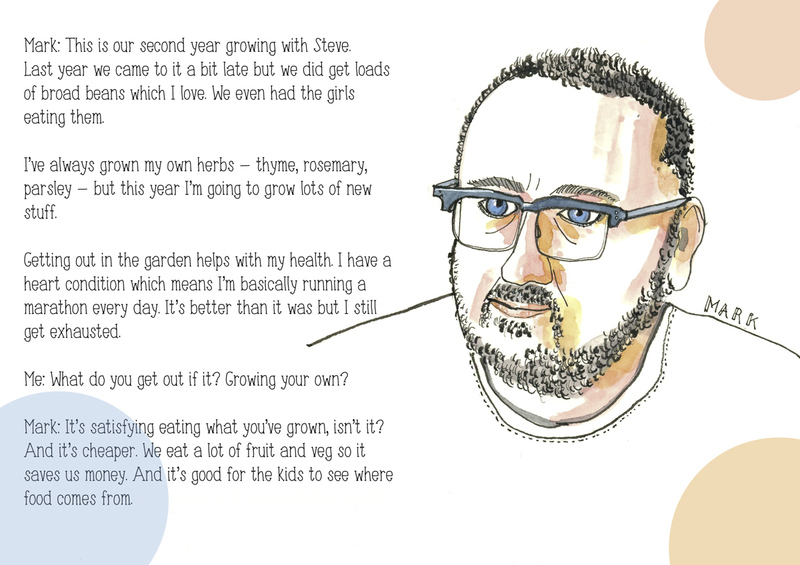 To round things off I ask some of the protagonists what they made of this year’s growing season… and what they might do differently next year.